You thought securing your endpoints was tough. 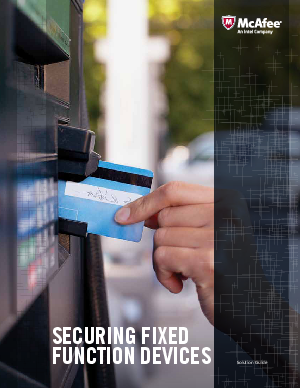 Fixed-function devices like ATMs, medical equipment, industrial control systems, multifunction printers, automotive and aeronautical systems, and point-of-sale (POS) systems such as cash registers, have their own innate security challenges. Many run legacy operating systems that are no longer supported by vendors, have restricted or no network connection, and function with limited CPU, memory, and available storage — a combination that makes installing traditional antivirus defenses and new security controls and patches difficult. Yet, fixed-function devices still face many of the same threats that target your desktops, laptops, and networks, including zero-day attacks and other forms of malware. Additionally, many of these devices must prove compliance to industry regulations like PCI DSS.